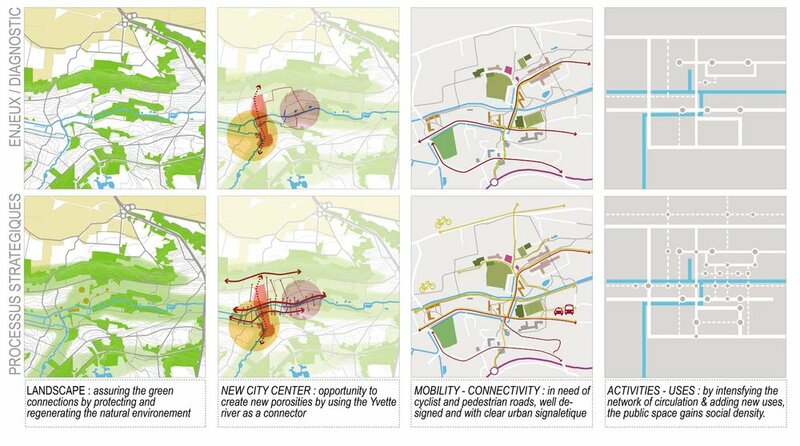 The process that we propose is a strategy of intensification of the soft mobility network and an introduction of several points of activities that use the existing and the extended infrastructure in order to provide the maximum creativity and plurality in the use of public space and generate links between nature, leisure and cultural activities. The concentration points will function as places of gathering, of community meetings, of recreation and sport, as well as small commerce or urban agriculture lots. The strategy for this intensification of public space takes into consideration the uses - current and projected- and the population’s habits. The implementation of the strategy follows the principle «Start Small – Grow fast » and complete a toolkit for the activation of the public space through active participation. Bures-Sur-Yvette is a suburb of Paris that is in possession of two major resources : a magnificent landscape and a diverse, active community. These assets are to be activated through a procedure that engages acupunctural interventions with the minimum impact on the landscape, but the maximum effect on the social densification.